F Troop U.S. cavalry uniform costume. 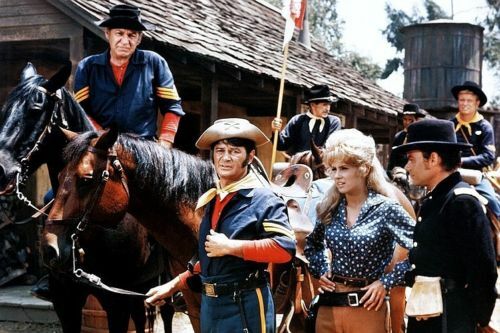 (ABC TV, 1965-1967) Vintage original cavalry uniform from the zany Wild West comedy F Troop. Consisting of a heavy midnight blue long sleeve cotton pullover tunic with button front V-neck closure and navy blue stretch fabric uniform trousers with goldenrod stripes down outer legs. Also includes a goldenrod neckerchief. In vintage very fine condition.